A battle for survival of the human species begins! The opposing worlds of biological and mechanical engineering spectacularly collide in the most terrifying way imaginable in Caprica: Part 1 available on DVD from 3rd January 2011, courtesy of Universal Playback. Telling the story of how the murderous Cylons came into being, Caprica follows two rival dynasties, the Adamas and the Graystones, as future events are set dreadfully in motion. Following the death of his daughter, Daniel Graystone (Eric Stoltz, Pulp Fiction, Mask) diverts his grief into researching artificial and biological intelligence and comes into conflict with the charismatic Joseph Adama (Esai Morales, TV's 24 and Jericho), beginning a battle between ethics, science and business as the war for the survival of the human race looms on the horizon. An absorbing and thrilling prequel to Battlestar Galactica and following on from the earlier part of the series, Caprica delves deeper into the events that lead to the destruction of Caprica at the beginning of the Battlestar series and offers answers to many fans' questions - whilst the thrilling and compelling events of Caprica pose a whole new set of their own. 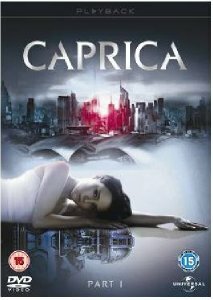 Produced by the creative masterminds behind Battlestar Galatica, including Ronald D. Moore and David Eick, Caprica is not to be missed, with the DVD containing a host of special features including deleted scenes, video blogs and a special feature looking at the world of Caprica with a sneak peak at Part 2, alongside audio commentaries from cast and crew. Copyright line: © 2009 Universal Studios. All Rights Reserved. Universal Pictures UK is a division of Universal Pictures International, which is part of NBC Universal - one of the world's leading media and entertainment companies in the development, production, and marketing of entertainment, news, and information to a global audience. Formed in May 2004 through the combining of NBC and Vivendi Universal Entertainment, NBC Universal owns and operates a valuable portfolio of news and entertainment networks, a premier motion picture company, significant television production operations, a leading television stations group, and world-renowned theme parks. NBC Universal is 80%-owned by General Electric, with 20% controlled by Vivendi Universal.